For my final set of cards I have these warm and bright washi tapes combined with a very subtle off white and beige scrapbook paper for my backgrounds which I have mounted to off white card fronts. 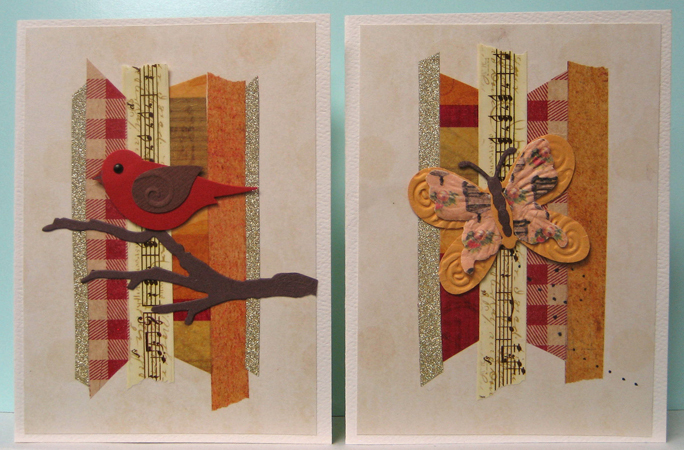 For my first card I again went with a bird theme. I die cut a portion of the bare tree (TH) using a scrap of brown cardstock, trimmed it to fit and adhered it to my card front. I punched a bird from red cardstock, coloured in the beak and added a tiny black brad for the eye. I punched the wing from brown cardstock, manually embossed it and adhered it to my bird. I added the bird to my card using 3D foam tape. For my second card I die cut the butterfly from yellow and manually embossed its wings, added a paper butterfly from my stash and layered onto it the brown body/antennae die cut (QK) from a different butterfly die set. I adhered it to my card front using 3D foam tape and added a dotted flight path using a fine tipped permanent marker. For my third card I die cut a large flower using the Tattered Flowers die (TH) from maroon cardstock and added some texture by colour washing the petals with watercolour. I fussy cut this cute laser printed button, used a black marker on its edges and watercoloured it yellow to coordinate with the background before adhering it to the center of my flower using 3D foam tape. I hand cut from green scraps a stem and two leaves, glued them to my card front and then adhered my flower over the end of the stem. To finish off my card I colour washed the stems as well for a bit more texture. For my fourth and final card I went back to my heart theme and layered several heart die cuts. I started with a red heart, layered on one with musical notes and finally added a smaller one cut from gold card and manually embossed. 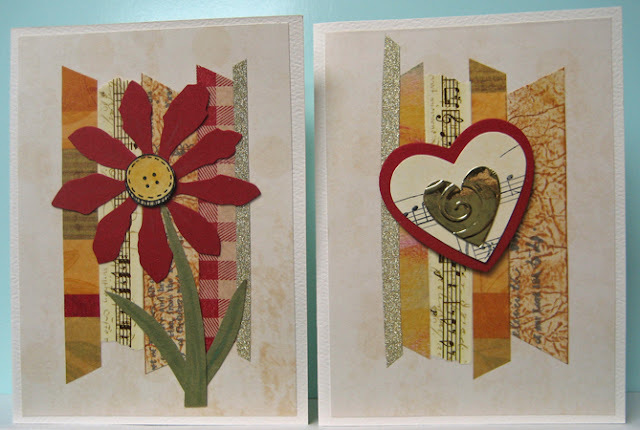 This heart focal element was added to my card front using 3D foam tape. I have so enjoyed making these four sets of cards!!! I love the collagy look of them and that they are very versatile. I may consider using this concept again for my card making in the future when I am looking to make cards without greetings. I still have a small stash of washi tape that needs to be used up and certainly strips of paper would likely have the same effect. Got some of those as well! !